Holly Holm defeats Ronda Rousey! I know that this blog is all about MLM top earners and the like, but I am going to post about one of my own personal loves right now, while it is so fresh! I love it and I have eluded to it on a few of my posts, like the one you see here! I just finished watching THE BIGGEST UPSET in all of combat sport history. The fight: Ronda Rousey – Women’s Bantamweight Champion of the world in MMA. She was also undefeated. She also NEVER lost a round in all of her MMA professional career. This is a woman that is slated to go down in history. She has smashed records and has given us quite the shows! Ronda Rousey is a true legend in the sport. But tonight – less than one hour ago, the biggest upset in the history of combat sports took place. How is it the biggest upset? Well, you look at the odds and that is how. From a betting stand point. When Buster Douglas defeated Tyson, he was -1400. In the upset where Matt Serra defeated GSP, he as something like -1200. The Challenger: Holly Holm – a World Champion Boxer. Holly was also undefeated in her MMA career. 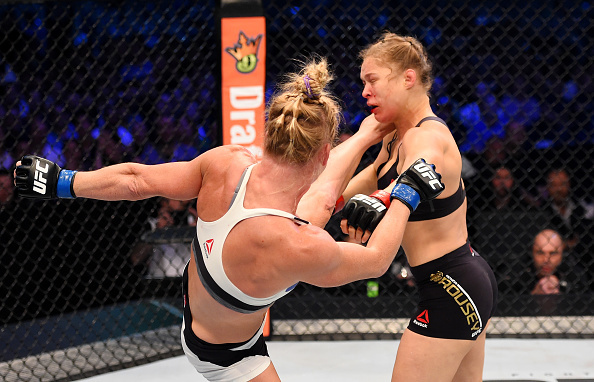 BUT – as awesome as that is, it was no stranger to Ronda Rousey to defeat the undefeated! She fought at defeated every woman that has stepped inside the Octagon with her. I have watched Ronda Rousey since she came on the scene defeat woman after woman. I have watched her attitude as she has gained one win after another. And in all fairness, Ronda Rousey is the reason that Dana White decided to allow women to fight in the UFC. She was the squeaky wheel. She is an incredible fighter, amazing to watch, she brought in the crowds and the money. I mean, what’s not to like about her if you are Dana White – right? But, with each victory, Ronda, in my opinion, became more and more prideful. More of a “I am too good for anyone” kind of attitude. And I am of the mindset that pride always comes before a fall. Well, let’s just say that I have been waiting for that ‘fall’ for a LONG time. I did say that she was good! I just didn’t like her attitude and the way she would insult and put down other fighters. So, I have patiently waited for an upset. Looking to any woman that could wipe that smug look from Ronda’s face. Tonight, Holly Holm, out fought, out boxed, and out performed Ronda Rousey. The Women’s Bantamweight Championship Belt. Yes, Holly Holm took the belt from a woman that claimed that she would leave the sport undefeated. From a woman that claimed that there was no one that could even come close to her skill level. A woman that laughed at any opponent that dared to step foot inside the Octagon with her. Holly Holm performed a brilliant fight tonight that at the knock out, had me in tears and on my feet! in their UFC women’s bantamweight championship bout during the UFC 193 event at Etihad Stadium on November 15, 2015 in Melbourne, Australia. I almost felt like I was in there and won that match myself! Now don’t get me wrong, I am not taking anything from Ronda at all. She is a brilliant fighter, #1 before tonight, and she did appear to be unstoppable. But I did not like her cockiness that she portrayed. Like she was better than everyone else and that her you know what, didn’t stink! I like fighters that don’t trash talk or put down their opponents. I think it is unnecessary to behave that way. I like when the good guys win! Like when Chris Wideman beat Anderson Silva the first time. I loved seeing that because I think Chris is an all around good guy and I hated the way that Anderson was always clowning his opponents and trash talking them. To me, tonight’s fight was about the ‘good guy’ winning. Holly stated in an interview that a lot of Ronda’s opponents are defeated before they step into the ring. Because they know who they are up against. They know her record. They know her confidence. They know her skill. And believe it or not, that can intimidate even the best of fighters! I was looking forward to this fight tonight but wasn’t really following it that closely until my hubby told me about the weigh ins and the way Ronda Rousey tried to intimidate and ‘walk down’ Holly Holm! Well, good for Holly, because she was having none of that mess!!! When I heard about that confrontation and then saw it, something inside of me lit up and I was furious. I WANTED RONDA ROUSEY TO BE DEFEATED! When the fight started, Ronda, surprisingly, did not come out in a blitz and rush Holly. She came out a little slower, more cautious. And Holly did not come rushing after Ronda as soon as the bell dinged either. Which a lot of Rhonda’s previous opponents have done. She was careful and she looked for angles. In the first round, Holly blooded Ronda up. A feat that has never been done before. Rhonda chased Holly across the cage for the full 5 minutes. She continued to dodge Ronda while picking her apart during the round. Ronda, a judo Olympian bronze medalist, was even taken down by Holly – just because she could. I personally think that that alone shocked the crap out of Ronda. Rhonda could not take Holly down to the playing field where she is most comfortable at. And the moment that they were on the mat, Holly had incredible defense against Ronda’s take downs. Ronda was not able to throw Holly around like she had with her previous opponents. I will be looking forward to the rematch as well as seeing how Ronda handles this tremendous upset and loss. I am hoping that Ronda humbles herself, trains harder, and comes back a better fighter. I hope that she is able to give Holly the credit that is due to her! You made this fan very happy!